A mother recently asked me for help because her children had stopped listening to her. When kids stop listening, parents often start yelling and nagging, and that leads to even less listening! It’s a vicious circle that you can stop. Today! Maybe even whisper at times if you want to be dramatic. Anything but yelling. It’s easy to tune out shouting, but a quiet comment? Ah, their ears will perk up as they wonder what special thing they might be missing! 2. Try to get eye contact. Smile and be patient. Kids should not have to experience up close and personal angry adult faces admonishing them to “look at me when I talk to you”! It would make you uncomfortable (and resentful) if someone did that to you, and kids feel the same way. Sometimes you can catch their attention by standing near them and waiting for them to look at you. You might even say “excuse me” if you must interrupt something they are doing. If you routinely look at your children and give them full attention when they speak to you, they’ll soon be doing the same to you. 3. Speak when you have something important to say. Maybe you’re being tuned out because you’re talking (or nagging?) too much. While it’s good to talk to children as you interact during the day, there should be a happy balance. If you are always interrupting their thoughts or usually have something negative to say, they may get in the habit of not listening, which means that in the process of tuning out the bad, they are missing the good things you say! If your kids are accustomed to you repeating many times, they know they don’t have to listen the first or second time, because you’ll keep on saying it. Switch to saying things once and they’ll pick up on this fast, especially if those first messages are about something fun! 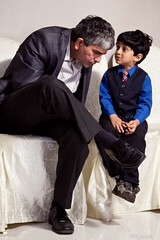 Try these tips and your kids will soon be listening to you again. You may also find that your children begin treating others as respectfully as you are treating them! Written by Karen Taylor, posted on 9 May 2012 at 9:02 am, and filed under Parenting. Bookmark the permalink.